The idea of smart locks has been out for a while, but at the end of the day, people still end up carrying either RFID or just use the lock itself. We pretty much carry our phone all the time now, and by the time we are at the door we are automatically connected to our own WiFi network. By using Serial to Ethernet (S2E), we can actually implement a true keyless experience, using our phone as the key and S2E to unlock the deadbolts. With developer edition, we first can power up the WIZ750SR through micro-usb port. 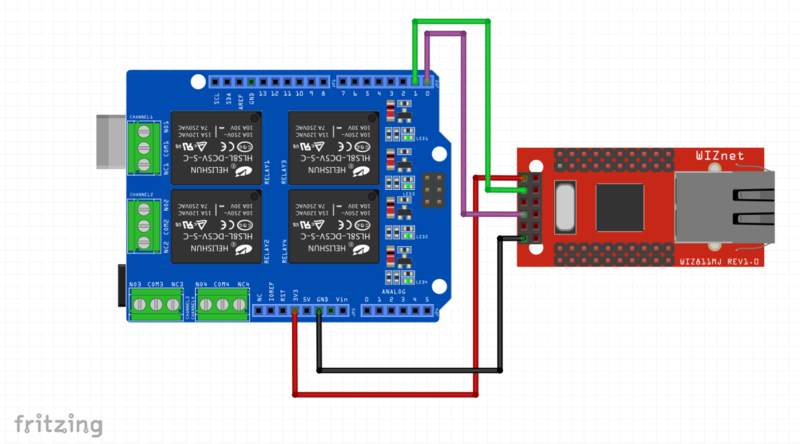 when everything is connected, we should see green LED on for connected to the ethernet, blue LED on for EtherNet add on working and red led on for device being powered on as figure below. For the most part, we need the following in our IDE, and this guide specifically used 64 bit windows. The deadbolts usually require 12V, while normal Arduino would only output 5V max, so in order to get the lock to work we can tap into the power source by soldering two wires at the power source like image below. We will use red wire as 12V and black wire as ground. If everything is successful, we can lock and unlock by using the knob through testing it should show up on the GIF below. We can use following code to make sure the lock works via receiver. At this point we can also remove the rotary knob as it is no longer needed. At this point if you enter "1" into tcp it should unlock the lock. We can also get rid of the knob at this point. the enter unit now looks like the photo below. Now that we can already unlock the door using TCP, the next step is building an android app so that user no longer need to carry the keys around. Below are a very simple app that we've built to unlock the deadbolt. Now that WiFi network becomes your key to the house as you'd be able to unlock deadbolts using WIZ750SR. The code for Android is following, and you can download the full from GitHub.